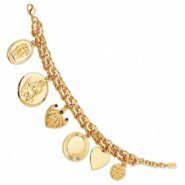 Charm Bracelet [FQGCT175] - $175.00 : Fine Jewelry for Romantics.com, Where luxury is affordable. Charm Bracelet that includes 6 of Jacqueline Kennedy's favorite charms. Charms include the 3 Graces, a palm fam with 3 blue Swarovski crystals, a disc, and engraveable heart, a flower and the Hercules. The largest charm came from JFK when he once mentioned how impressed he was with her hard work. She simply smiled and replied in Latin, "Labora non sumptus est," which means "labor is no cost". So, he had a charm inscribed with the saying on one side and a tongue-in-cheek figure of Hercules on the other side.